Sacramento Real Estate Blog, by Erin Stumpf: Officially an Outstanding Life Member of the Sacramento Association of Realtors Masters Club! Officially an Outstanding Life Member of the Sacramento Association of Realtors Masters Club! 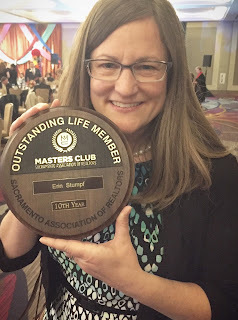 This last week I was honored for my high level of productivity as a Sacramento Realtor, and designated as an Outstanding Life Member of the Masters Club. To qualify as a member of the Masters Club, a Realtor must be in approximately the top 8-10% of all Realtors in Sacramento. The criteria for being an Outstanding Life Member is qualifying for the Masters Club for 10 out of the last 15 years. I am 10-for-10, having qualified for 10 years in a row! I am definitely among the youngest members of this elite crowd at the age of 38. This was the culmination of a decade of hard work, including time serving on the Masters Club Steering Committee and as its President in 2012! Many thanks to all of my clients who entrusted me with their real estate transactions. I look forward to many more years as a top producing Realtor. Contact erin@erinstumpf.com or 916-342-1372. Erin Stumpf is a licensed Broker (#01706589) working with Coldwell Banker in Sacramento. She is a Sacramento native and graduated from CSUS with a Bachelor's Degree in Spanish (2001) and a Master's Degree in Public Policy & Administration (2018). Erin specializes in representing buyers and sellers with real estate transactions involving new and resale single family homes, condominiums, and 2-4 unit structures. Erin has successfully negotiated several short sales for her clients, has vast experience with bank repo properties, and works with a lot of trust and probate listings. She focuses her attention on the Sacramento and surrounding communities; especially Downtown/Midtown Sacramento, East Sacramento, Land Park, Curtis Park, Tahoe Park, Hollywood Park, Arden, Carmichael, Pocket / Greenhaven, Rosemont / College Greens, Fair Oaks, Orangevale, Foothill Farms, Citrus Heights, Antelope, and Elk Grove. She holds SRES (Seniors Real Estate Specialist) and CDPE (Certified Distressed Property Expert) designations. She is Past President (2012) of the Sacramento Association of REALTORS Masters Club and an Outstanding Life Member. CLICK HERE for a detailed Market Analysis of your home's value! CLICK HERE to Search ALL Greater Sacramento Open Houses! Do you have a home for this buyer? Copyright - Erin Stumpf, 2007-2018. Content on this site MAY NOT be reproduced or republished without written permission from Erin Stumpf. Lyon Real Estate, Dunnigan Realtors, and Coldwell Banker (and their agents) are licensed by the Bureau of Real Estate, State of California. This website is not intended to be a solicitation for the purchase, sale, or lease of real property outside the state of California. Information contained herein has not been verified by Lyon Real Estate, nor Dunnigan Realtors, nor Coldwell Banker (or their agents). Interested parties should independently verify this information. Any buyer or seller should seek independent tax and or legal advice prior to engaging in any real estate transaction. Lyon Real Estate, Dunnigan Realtors, Coldwell Banker (and their agents) do not give such advice. By giving Lyon Real Estate, Dunnigan Realtors, and Coldwell Banker (and/or their agents) a phone number, you are giving them permission to call you in response to your request, even if this phone number is in the State and/or National Do Not Call Registry. Equal Housing Opportunity. Furthermore, Lyon Real Estate, Dunnigan Realtors, Coldwell Banker (and their agents) do not give tax and/or legal advice pertaining to short sale transactions. Property owners that are considering short sales should seek tax and/or legal advice from qualified professionals. You may stop doing business with us at any time. You may accept or reject the offer of mortgage assistance we obtain from your lender [or servicer]. If you reject the offer, you do not have to pay us. If you accept the offer, you will have to pay us the lender approved commissions for our services. Dunnigan Realtors is not associated with the government, and our service is not approved by the government or your lender. Even if you accept this offer and use our service, your lender may not agree to change your loan. Become a fan of Sacramento Short Sales on Facebook!